A priestess, standing beneath an oak tree and attended by a small girl, is preparing to sprinkle the contents of the bowl in her left hand on to the altar in front of her. 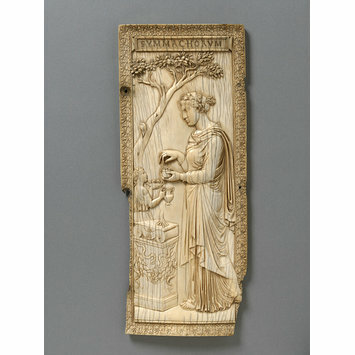 At the top of the panel is the inscription 'SYMMACHORUM', referring to the Roman Symmachi family and linking this panel to a second one in the Musée National du Moyen Age in Paris, which refers to the Nicomachi family with the inscription 'NICOMACHORUM' and depicts a similar priestess. Together the two panels originally formed a diptych, made for these two Roman families, probably to celebrate the god Dionysus. As such they provide vital material evidence of the dying gasp of paganism in aristocratic Late Antique Roman society around the end of the 4th century and beginning of the 5th. Ironically, both panels probably partly owe their survival to having been incorporated into an early 13th-century reliquary shrine at the abbey of Montier-en-Der in France, where they remained until the French Revolution. The shrine was then broken up, but the ivories escaped destruction and resurfaced just after the middle of the 19th century. 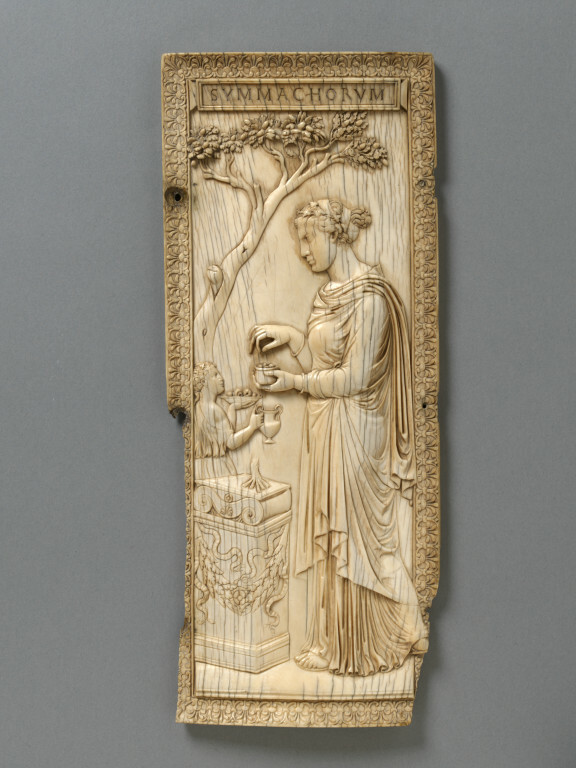 Because of its excellent condition - in contrast to the sadly damaged Nicomachi panel - the Symmachi leaf is one of the most important existing ivory carvings from the Late Antique period. Only a handful of ivory reliefs from this period survives, but from this small sample it is clear that the carvers worked for both pagan and Christian patrons simultaneously. From a stylistic point of view, among the ivories closest to the Symmachi panel is a plaque, now in Milan, showing the Marys at the Sepulchre. A priestess or initiate, her head bound with ivy (the plant of Bacchus), standing beneath an oak tree (sacred to Jupiter), takes some corns of incense to sprinkle on the fire of an altar. A boy (or posssibly a girl?) behind the altar holds a wine jar and a bowl of fruit or nuts and a two handled vase, or Cantharus. At the top the panel bears the name 'Symmachorum'. The damaged border is of delicately carved anthemion ornament. Inscribed on a table at the top. The inscription refers to the family of the Symmachi at the top of the ivory. This panel formed originally the right part of a diptych. The other part - much damaged- is now in the Musée de la Moyen Age in Paris and depicts a similar figure making an offering before an altar and the inscription 'Nicomachorum. In 1717 these two ivories were still in the Abbey of Montier-en-Der attached to a reliquary shrine made in the thirteenth century with the inscription: 'His tabulis hoc ditat opus Bercharius illi Quas peregrinanti terra beata dedit'. Adso, (d. 992) , Abbot of Montier- en- Der, reported in his Life of his predecessor, St Bercharius (d. 685), that the saint brought back from Palestine many relics and ivory tablets of great beauty. By 1840 and the ivories had both disappeared, and in 1860 the Cluny leaf was found in a well at Montier, the present tablet was at the same time in private hands in Montier. Historical significance: Both panels are of particular significance as members of the old senatorial families in Rome revived the pagan religion at the end of the fourth century, and had choosen an historicist neo-attic style. This is shown in the statuesque elegance and cold purity of the carving which creates the illusion of depth. Ivory carvers did however not work exclusively for the adherents of one particular cult: a Christian ivory in the Castello Sforzesco depicting the three Maries at the Sepulchre may have been produced in the same workshop as the present relief. Boutght by the Museum in 1865 for 420 (from the Webb Collection). The purpose of the diptych is uncertain: it has been suggested that it was made to mark the assumption of the priesthood of the four cults of Ceres, Cybele, Bacchus and Jupiter by women of the Symmachi and Nicomacchi families (or that it was issued to commemorate the death of Q. Aurelius Symmachus in 402), but it is more generally thought that it was made to celebrate a marriage, either in 393/4 or 401, between members of the Symmachi and Nicomacchi families. It could also signify these noble families' adherence to the ancient cults.